A question that we get almost every day as your personal optimization specialist is; “How to optimize your website for multiple keywords?”. Actually this is a really good question, because of course you don’t just want to rank high on one keyword in Google. Of course, before you can start optimizing for mutliple keywords, you should choose these keywords. Depending on which keywords you choose, you should also choose your way of optimizing. Sometimes it’s better to optimize for one keyword per page, but it’s also possible to optimize one page for multiple keywords! If you’ve chosen your keywords, it’s time to choose your optimization strategy. We’re going to tell you exactly why you should choose which strategy and how to use this strategy to become a success in the search engines and how to rock multiple keywords. Most of the times the best strategy is to combine the two following ways of optimizing. The first possible tactic is to optimize your website for one keyword per page. This is a good choice if you want to be sure that your page is fully optimized for one keyword. It’s a fact that if you want to 100% optimize your page, the best way to do this is to target just one keyword. So when you’ve got to deal with highly-competitive keywords, it’s probably more effective than using multiple keywords for one page. For example, it’s really hard to give multiple keywords an equal amount of density on your page and you’ve got a chance that you won’t optimize on a specific keyword as much as you need to, to rank higher. This way you’ll end up ranking on multiple keywords, but you won’t get in the top 10 as easily. This might be very ineffective and you won’t get as much traffic as you want! So, when and why should you choose to optimize with one keyword per page? You can also choose to optimize your page for multiple keywords. This tactic might be very effective if you’ve got very much target keywords, which you can split up in multiple small groups or cohesive keywords. Like we said before, it can be hard to optimize for multiple keywords on one page. That’s why it’s very important to choose keywords that are very easy to combine and you should always have one keyword that’s the most important one and the center of your optimization. This way you can prevent that you don’t optimize at all. When should you choose to optimize for multiple keywords per page? Keyword tool? Webtexttool? Google keyword tool? There are a lot of tools on the internet that can help you to do keyword research and to optimize your website. Depending on your optimization tactic, there are different tools that you could use. For example, if you want to optimize your page for just one keyword, it’s very easy to use webtexttool to choose your keyword and to optimize your content directly for this specific keyword. This way you know for sure that your page is 100% optimized. You can start your free trial today! If you want to optimize your page for multiple keywords, this is something you could also do with webtexttool, combined with the Google keyword tool. Do some very good keyword research and cluster your keywords in multiple small groups. This is when the Google keyword tool comes in very handy. Like you can see in the Quicksprout video, you should use the keyword tool see if there are any other low search volume keywords that are closely related to your targeted keywords. It’s important that you choose keywords that have the same mindset as you have in mind for your content. After you’ve made a small list of related keywords, you could use them as input for webtexttool. This way you’ll be able to optimize your content 100% on your most important keyword and at the same time you’ll be able to optimize partially on the related ones. 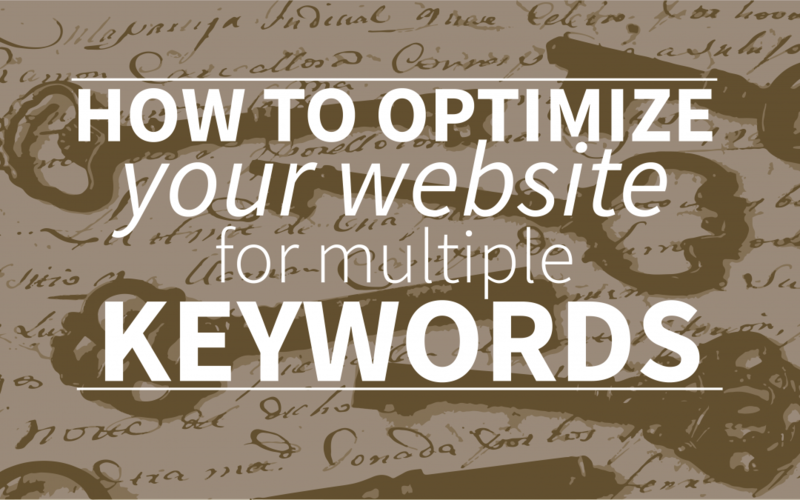 We hope that this makes clear to you all how to optimize your website for multiple keywords. Make sure that you make the right choice and don’t try to optimize your page on too many keywords. Four cohesive keywords is really the maximum for one page, otherwise you won’t be able to optimize at all. Keep that in mind & good luck!